SELLER'S DESCRIPTION: Mutton Cove, Devonport. Excellent vintage card by Stengel No. E 18643. Not p/u and in vgc. 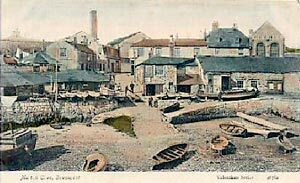 Fine harbour scene with five boatmen posing in their boats for the camera, with pub, shops and several more onlookers in the background. SELLER'S DESCRIPTION: Mutton Cove Houses. Condition of Card is Fine. Unused. 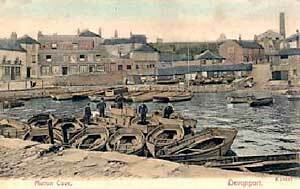 Fine early last century view of the buildings as they were in this part of Devonport. 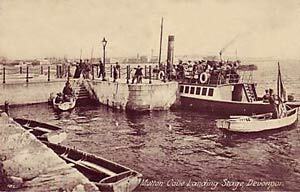 SELLER'S DESCRIPTION: Mutton Cove Landing Stage Devonport c1910. Published by Albert Pengelley of Devonport. Unposted. Some minor staining top left, otherwise good. A pleasure boat is moored at the jetty. A dinghy is landing at the steps after bringing passengers back from Cremyll, while another dinghy is headed out to Cremyll.